Consult us on anything regarding mechanical components. We are not limited to the traditional production method. We will consult and advice you on the best possible material and production method based on SANKYO's expertise using VA (Value Analysis)/VE (Value Engineering) process. As a trading company we have a broad network in Japan and overseas. 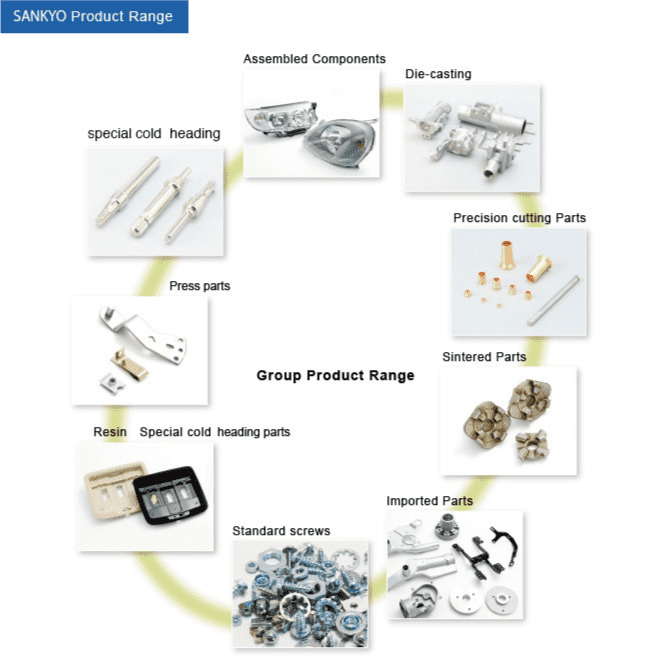 Not only we are able to provide you with a single component but also assembled components using our product manufactured with various methods by SANKYO group companies. By placing an assembly order, SANKYO will manage everything from parts selection to completed assembled components. This will help reduce time and costs for material search and selection. together at once when you have a less than a container load of goods that you wish to import from China. Using our distribution system will help reduce your total distribution cost. We can temporarily store your goods at one of SANKYO offices in your area or provide other delivery methods to your preference like Kanban or Deposit. SANKYO has a proven performance and experience in various industries including automotive parts that play an important role in safety. We are proud to provide our knowledge with this varied experience. We have sound of manufacturing method, materials and technologies to provide customers with the best solution.